Sparkle Creations Rubber Stamps Preview~ Mr. and Mrs.
Aren't they the sweetest couple?! I just love this image, and guess what? You can get it, plus the other fabulous new release images TODAY!!! For my card I used some gorgeous My Mind's Eye Follow Your Heart Be Happy dp, and the sentiment comes with the image. Be sure to visit all rest of the SCRS designers for more peeks of Mr. and Mrs. Sparkle will be giving away Mr. and Mrs. to one lucky person! For a chance to win, you need to comment on all of the designer's blogs (list below). Then head on over to the SCRS blog and comment on the Mr. and Mrs. post. You have until midnight EST each day to comment. The lucky winner will be announced the following day! Stamps: SCRS Mr. and Mrs. 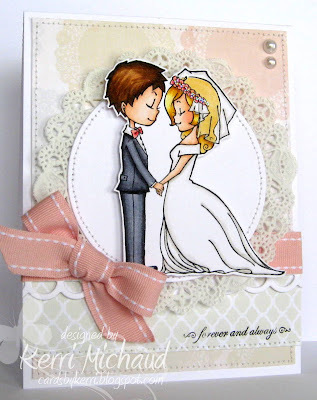 These card is beautiful too, lovely image, great job! WOW! This is a GORGEOUS card--LOVE your coloring and those papers! Such a cute image on a lovely background. Beautiful! Beautiful card. Love the lace underlay.